Well, Napalm Records have decide to change their "band-team" or what. 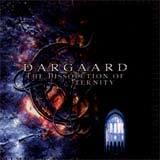 Usually releasing extreme CDs, this one comes as an enormous surprise .... considering Dargaard plays a gothic metal and that the guitars have been forgotten in this Dissolution Of Eternity. If you were missing a sleeper just before going to bed and you are the kind of fans who buy only CDs released by metal labels, this one is for you. Dargaard could have used The Dissolution Of Eternity for a soundtrack film actually. Take Within Temptation vocals and adds all kind of sounds related to the middle age and you got the picture. If I have to quote this one as a metal CD, the quote is very easy (5 / 100). If we listen to the whole CDs with a gothic perspective, it is a good one .... but The Dissolution Of Eternity is definitively missing the guitars and the drums to be accepted by the metal fans out there, even though the female vocals are really cool and the music quite interesting ! I am wondering if this is in fact a Napalm Records' joke ??? If this is a joke, that's a the Joke Of The Year ;-). But do not misunderstand me, this one is cool (actually the third record of this band) .... but simply doesn't belongs to the gothic scene, at least not the one we use too. So if you are a gothic fan or a huge fan of atmospheric metal, you can check this one, but I highly suggest you to try before you invest.